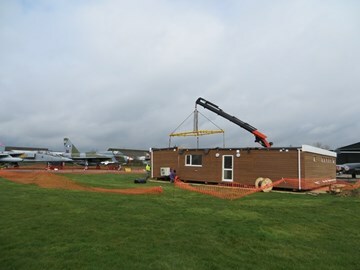 Apologies for a slightly delayed update – however we are pleased to advise that Avalon Cabins delivered the new café & toilet facility to the museum Southfield Site** close to Display Hangar 2 on Tuesday 27th March 2018. Despite the damp weather conditions the four main sections of the new building were expertly reassembled by staff from Avalon Cabins and the Lincoln transport company SG Haulage Ltd. The teams immediately started to reconnect the pre-installed fixtures and fittings in preparation to the eventual handover of the building to museum. In the coming weeks we will be completing the installation of mains electricity and water to the building; and making the waste water connections to our package waste treatment system, which is also located on the Southfield Site**. Once this work has been completed we will be working towards the start-up of catering operations in this new facility. We would like to take this opportunity of thanking all of our partners in this long-running project, for their guidance and patience in helping us bring this project together. We would also say a special thank you to everyone who has contributed in so many different ways towards the fund raising efforts that have helped this project over the years – we could not have done this without you all! ** The Southfield Site is 12.38 acres of land that the museum purchased in 1995 and is currently home to Display Hangar 2, the RAF Winthorpe Memorial Garden, several museum aircraft and now the new Museum Café & Toilets. Further updates will appear here as any fresh information about the project becomes available.